If your mom or wife enjoys her time in the kitchen, get her a kitchen tool that is unique, functional and most of all, thoughtful. Check out these hand-picked gift ideas and give her a gift that she’ll cherish for years to come. NOTE – Some of the products in this post were given to me by their manufacturers, some I have owned for years and a few are on my wishlist. All opinions are mine alone. 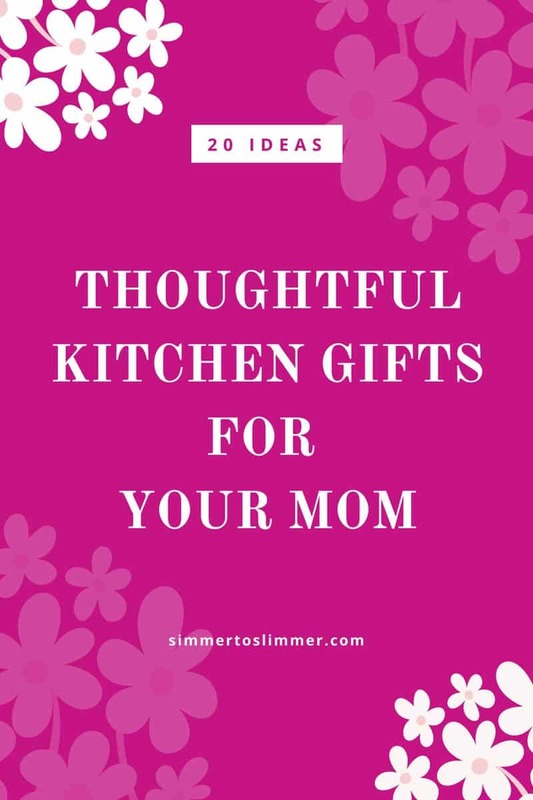 Buying a gift for moms who like to cook can be tough for a few reasons – because they may already have what they need or they could be very picky when it comes to tools they use in the kitchen. 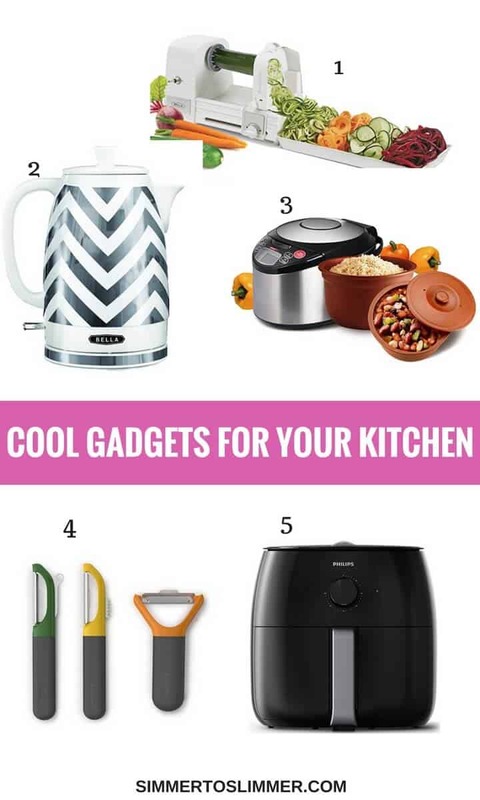 Here’s a list of some cool new kitchen finds that I came across this year and some trusted companions I have had for years – I am sure you’ll find at least a couple of gift ideas that are unique just like your mom. Electric Spiralizer from Bella – This is no ordinary spiralizer, it is an electric one. Makes spiralizing effortless :-). Ceramic kettle – Yet another Bella product that is both gorgeous and functional. It boils water faster than a microwave and auto shuts off when done. Perfect for tea-lovers in your house. It also comes with a detachable base that allows you to easily transport from your countertop to a coffee table. Vitaclay chef slow cooker and yogurt maker – This Vitaclay multicooker is a dream come true for anyone who knows how flavorful food turn out when cooked in clay pots. I made chicken biryani in the Vitaclay yesterday and it tasted as if it was slow cooked for hours like any traditionally cooked biryani! A must-have kitchen electronic item for those who savor and crave food traditionally cooked in clay pots. Peeler set – This set of peelers from Joseph Joseph is super functional. It has a straight peeler for everyday use, a serrated one for soft-skinned fruit and a Y shaped julienne peeler. Phillips Air-fryer – This one is on my wish-list. Phillips air-fryer does a lot more than just air fry. It also grills, bakes, and roasts. Get crispy fries without deep frying. Cheers to good health! Wusthof knife – Every budding chef’s dream is to have a quality knife in their arsenal and this 6-inch all-purpose Chef’s knife does any job well. It is very comfortable to hold and makes chopping feel less of a chore. 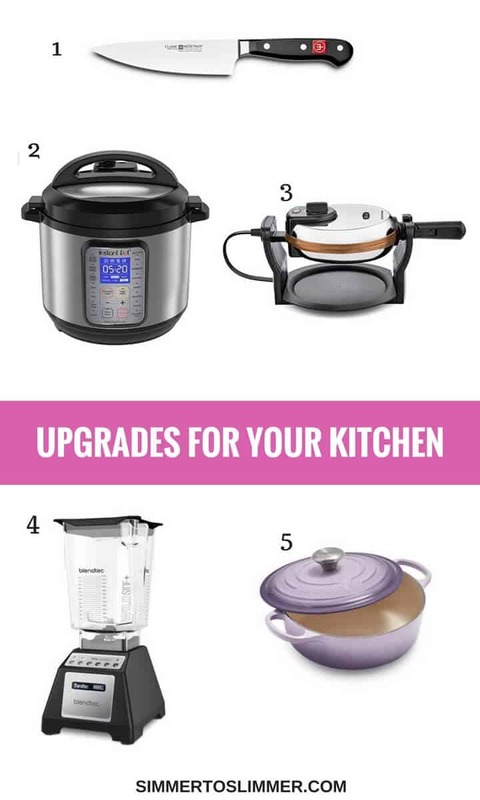 Instant Pot Duo plus – If your loved one already owns a DUO and has been looking for another Instant Pot, then gift her DUO plus. With one touch of a button, you can boil eggs or make a cake without having to memorize the manual settings as you have to do in DUO. Also, it lets you sterilize bottles – perfect for new moms. Waffle maker – This waffle maker with ceramic copper titanium coating makes waffles 30% faster than standard non-stick coatings. Yay! to less time in the kitchen. Blendtec – I will be lost without my Blendtec. From idli batters to banana bread, I use my blender for everything. They do have a Mother’s day sale going on that is totally worth checking out. Le Creuset – Which cook doesn’t want a Le Creuset dutch oven in their kitchen? These beauties are perfect for slow cooking, simmering soups and stews, and baking everything from side dishes to bread. Have you seen their new color –Provence? It is gorgeous! Are you familiar with the brand Joseph Joseph? 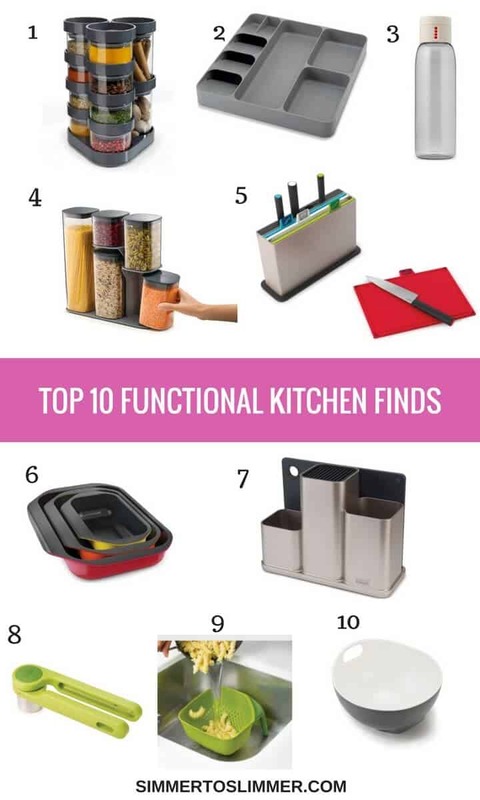 They make THE best and uber functional kitchen products. Here are my top favorites. SpiceStore – While I store my ground spices in a spice box (masala dabba), these 10-piece glass jars are perfect for whole spices. I totally love them. DrawerStore – What’s cool about this drawer organizer is that it combines two drawers into one to allow you to store more spoons. Dot – If you are like me and need a constant reminder to hydrate yourself, this cleverly designed bottle will come handy. The lid displays a new dot each time you refill so you can keep count of the number of bottles you drink. Podium – I love this storage solution for dried food. They neatly stack on each other, look great on the countertop that lets you access each container with ease. Index with Knives – The Index™ with knives set includes four color-coded cutting boards with four corresponding knives to help reduce cross-contamination and make food preparation even easier. Nest Oven – The stackable roasting trays are made from high-quality carbon steel and have a dual-layer non-stick coating. They feature easy-pull handles at the front making it easier to pull the trays out of the oven and wide side handles for carrying. CounterStore Worktop Organizer – This highly practical organizer lets you store all your essentials in one convenient place and includes a non-slip chopping board. Perfect for compact spaces. Helix Garlic Press – The innovative 2-piece design of Helix Garlic Press, makes crushing garlic cloves simple. The clever design utilizes the power of the shoulders to make pressing your garlic effortless. Square Colander – This ergonomic colander makes draining your food even easier with a vertical handle to keep it upright and stable if placed in a sink and, when held, leaves one hand free for operating the tap. Tilt – This clever mixing bowl has a wrap-around, non-slip base which allows it to be tilted at an angle to make mixing, whisking and combining while baking easier. To get 15% off your first order for Joseph Joseph products, click on this link. Do you have a list of items that you absolutely love? Please share them with us by posting in the comments. Thank you so much for sharing these great gift ideas with us! I got an air fryer for Mother`s day, and I love it. Cooking healthy and yet delicious food for my kids is a dream come true.